Mary King was a natural born psychic and Clairvoyant, the mother of our Spiritual Teacher George King. She lived at Cranleigh House in the early 1960's. 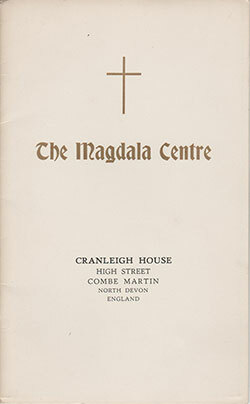 On Februrary 3rd 1960 'This amazing and unique 'Magdala Centre' came into being through a directive given by the Master Jesus to it's founder Mary King' at Cranleigh House, High Street, Combe Martin. The Magdala Centre Booklet below gives pictures of The Magdala Centre as it was in the 1960's and explains that it was a centre of Healing and Metaphysical Studies, it is a fascinating story and is part of the rich spiritual heritage of this house. On page nine of the Magdala Centre booklet it says, 'Many pilgrimages have been made to Holdstone Down and the pilgrims have visited 'The Magdala Centre' and have gained in Knowledge and Wisdom through the many manifestations which have been experienced there.' We aim to carry on the traditions started here by Mary King and supported by her son Dr George King, Founder President of the Aetherius Society. Following in the footsteps of Mary King we provide a venue for healing, yoga classes & workshops and a B&B/retreat for those who need to retire from the world, for a short time, to recover their strength and health or to have a holiday in beautiful surroundings, benefiting from good vegetarian, vegan or raw food. We can sense the presence of Mary King at Cranleigh House and one of our most popular rooms is named after her.